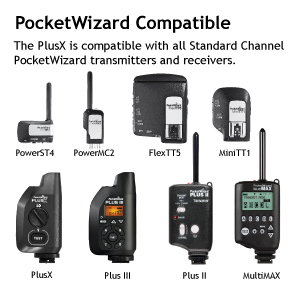 Pocket Wizard, the industry leader in radio transceivers for studio flashes and speedlites, recently announced their budget friendly PlusX. With the PlusX's top notch build quality, updated feature set, and friendly price, there is no denying that this radio trigger will take the Strobist market by storm. Last year, Pocket Wizard released the high-end Plus III, which offers all of the bells and whistles any photographer could ask for. Although the Plus III sells for less than the classic Plus II did, photographers still complain that the price is too high. Now for the million dollar question, does the new PlusX offer enough bang-for-the-buck or is the Plus III a better buy? Find out after the break. Pocket Wizard PlusX and Plus III feature comparison. As you can see from the table above, the PlusX and Plus III offer the same compact and high-end plastic housing, internal antenna, massive radio triggering range, and triggering performance. Both transceivers take AA batteries and offer a LED battery life indicator. The real difference between the two units is that the Plus III offers 22 more channels, Quad-Zone triggering, and an LCD display. 3. Covers an event where dozens of photographers will be filling the standard 10 radio channels (formerly only 4 channels). 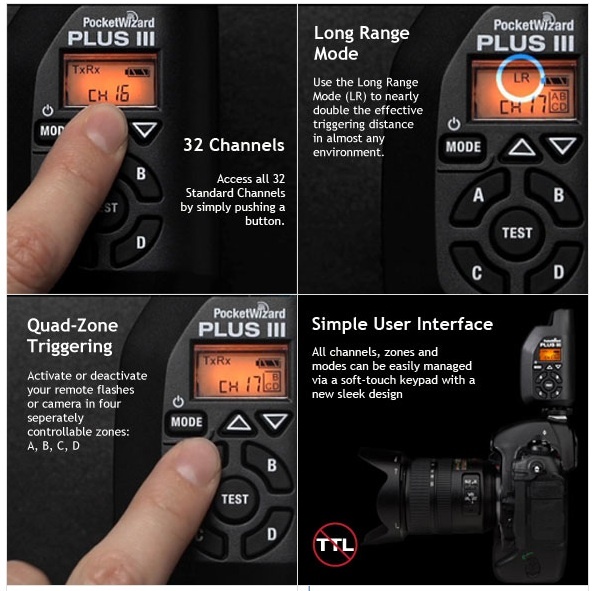 In any of these scenarios, the photographer can benefit from the Plus III's 32 channels (#2/#3), Quad-Zone triggering (#1/#2), and Long Range Mode (#2). The Pocket Wizard Plus III unique feature set. The PlusX on the other hand is targeted for users who work individually or in small groups and those who have a lower budget for reliable radio triggering. There is no denying that the simple user interface will create a smooth and quick work flow when working alone, with subjects' family and friends, and inexperienced college interns. Watch the video below to see the PlusX in action. The Pocket Wizard PlusX is a great buy and offers plenty of bang-for-your-buck, especially when considering the original industry standard Plus II that was nearly twice as expensive, offered only 4 channels, and had no battery life indicator. The choice between the PlusX and Plus III is simple. If you need the transceiver for basic flash triggering and remote camera use, save a few bucks and buy the PlusX. If you work with dozens of lights, in huge venues, or alongside an abundance of photographers crowding the radio channels, then spring for the Plus III. Whatever you decide, keep in mind that you need one transceiver for you camera's hotshoe and one for each flash. In a basic two flash setup, you need three transceivers. That would run you $297 for a PlusX setup or $447 for a Plus III setup. What are your thoughts on the Pocket Wizard PlusX and Plus III? Is the PlusX overpriced? Is there a better alternative on the market? Share your thoughts in the comments below! Thank you for your hopeful post. I am very glad to read that an i thing i will be very grateful by flowing it. I will to be a unique visitor of your blog. Can I help from you. I have a site that is similar to you. If you permit me then I want to use your article in my blog. Oh, now this is exciting! What a lucky find for me. I look forward to participatingWizard101! or 2x Plus iii and a single Plus X(purely for its simplicity? Will I still be able to access full flash settings in-camera. I may use 2 other optical slaves in addition. I gues I will also lose use of the hash pop-up flash. does any of these triggers have power save AUTO-OFF? Photo Boots World is a perfect choice for any party. They have the most unique and advance style photo boots that may satisfy your party needs. 360 product product photography requires extra consideration when it comes to picking a tripod and a tripod head. 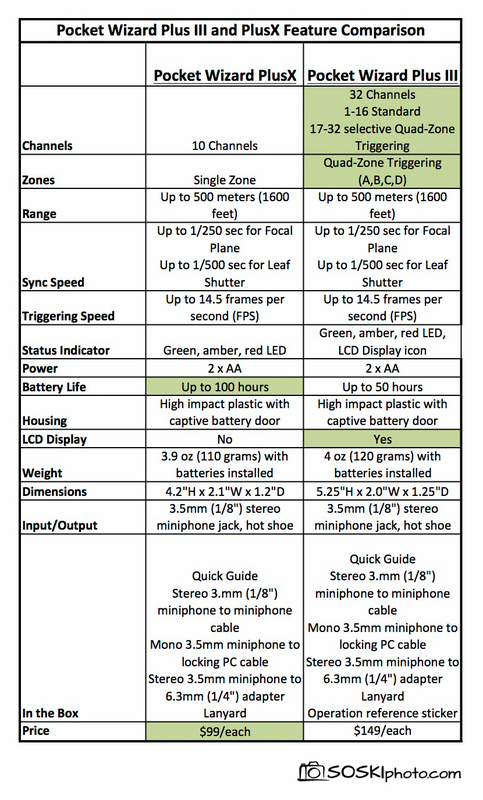 Here we would like to share few helpful tips on how to pick the right equipment. Wedding photographers time after time have been told from grooms and brides "the wedding day flies past in an instant" and all that there is following your wedding day are your wedding photographer So it absolutely is a good idea to spend a bit of time exploring the best Raleigh photographer for your Raleigh wedding.